Just in time for Black Friday, Verizon now has released the LG Venus, and will be followed by the highly anticipate LG Voyager on Wednesday Nov 21. The LG Venus is a follow-up to the Chocolate series, keeping the slider design, but replaces the navigational d-pad with a touch-LCD display under the primary QVGA display. It can be purchased now for $199 after a $50 rebate on a 2-year Contract. For those looking for the Pink Venus, you'll have to wait until Dec 11. 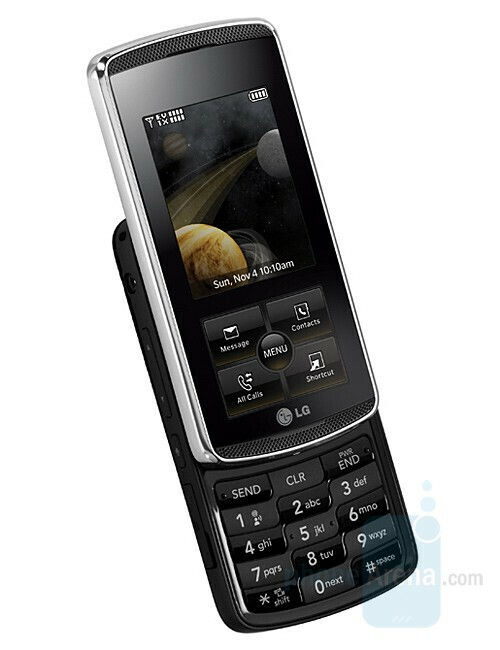 Even thought the LG Venus is a nice design, most people have been waiting for the release of the LG Voyager, which is an enV on steroids. The Voyager is by far the most advanced non-PDA/Smartphone in Verizon's holiday line up. MicroSD cards up to 8GB in size. You can read our Hands-on Preview of the LG Venus and Voyager. Expect our full in-depth review in a few days. I really cant wait use the V-Cast feature. Why buy an ipod when I get the best of both worlds. I lasted this long of of everyones reviews and comments. When I get mines I will let the world know. You probably wouldnt care, cus you all will have yours too. Ok, I'm sitting at home from a day off sick(I am really sick, no B.S) and I am glad I have the flu right now. The reason? So I can rest up, sleep till tomorrow and then right after work, I am going to get the phone of phones: THE L......G.......VOYAGER! Oh man, it's about time and I really can't wait. I am just hoping that this phone will live up to the hype that everyone is talking about. And if it doesn't? Well, I would never sell my soul to the devils that exist in the cell phone world(AT&T, T-Mobile, and Sprint). I'll probably wait for the Samsung SGH U-940. That's also gonna be hot! I hope everyone is going to enjoy this phone. Well the Voyager shipped today with an ETA of 3pm tomorrow. Free overnight shipping, can't beat that! Might want to go before work....this is a phone that a lof of people want and may not have a lot in the stores at first. good luck. Hey, thanks so much for the heads up. I really appreciate it. Almost everywhere I have gone in any Verizon store, you ask to be requested for notification on the Voyager and I kid you not, every store has an average of 5 pages or more of customers who want this phone. I think it will be hot. Will it sell 1 million units plus like the iphone? I don't know and I don't care. But what I am hoping for is that if it is successful, I hope the LG concept designers will have thier eyes and ears open to what we, the customers have to say good or bad. That way, they will be able to make things better. Again, Anonymous, thanks so much for the heads up and good luck as well on your end. Since I work for them, I got a chance to play with the Voyager for the last seven days ( store Demo ). I gotta say this is a sweet phone that will definitely compete with the iPhone in sales. We already have customers drooling at the door before we open just so they can ask when the phone arrives. The camera on the phone is sweet. There are just two changes on the phone I would make. First, the camera: Don't even think of taking a picture with a moving subject. Although the auto focus makes it look like you got the perfect still shot, the end result is a blurry pic. Second, the HTML browser: I wish is supported Flash so I can see videos on places like YouTube. Macromedia doesn't have a Flash version for the phone...at least not yet. Other than those, this is one sweet device. 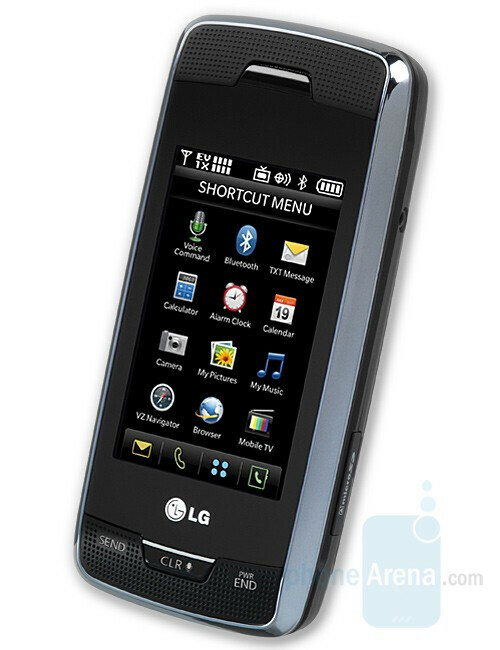 To Sammo and others as of 11am west coast the LG voyager was sold out through customer service and soon stores. If you haven't gotten it sorry there is not any info on how long will be till more or how many we had to start, to any who pre ordered you will not have to wait it was put aside and still coming to you. Like said before hot phone, and I've seen it in person I can see why they are calling it an iphone killer, has updated mob tv programs too the html format is internet styal like a pda and all you need is vcast to have unlimited browser time unlike pdas who need that 44 add on. ITS WORTH IT to get it because the mb will add up people. I am jelouse to any who have it as an empl I wont get it till maybe end of Dec or Jan. I checked 14 neighboring stores and we were all sold out here too in the SF Bay area. We got one of the largest shipments being a flagship store of only 35. All were sold before 11:30am. Our store was good about it and took a waiting list a head of time. hey the stores all by me in NJ are sold out and I was wondering if they are getting shipments on friday in then what time? because i was going to go at 7 to the store but is it worth it or do shipments come later like how do i know?? also when i was at the store on wed i saw a truck delievering lots of phones so im thinking they just said they are sold out but were getting them so they can sell them right at 7 on friday you think soo??? I received mine at 1pm central time Nov. 21st. I havent put it down since I got it. My family and friends love it as well. I watched clips of I Love New York, downloaded songs from every cd I own, sent pictures, etc. I have a 4gb memory card. Work will be more interesting since I have my new Voyager. Black friday I will go look at some silicone cases. Leather as well. This is not as bad as viewers try to make it seem. Take it from me. They just expect TOO PERFECT. I wonder if accessories will be on sale for Black friday. May have to order of line to avoid the mad crowd. Enjoy!!! hey i ordered my phone by phone just now and the lady said it will come in two business days?? is that correct because all stores they are sold out but do you think I will get in by fed ex in 2 days ahhh!!???? You can still order a Voyager or Venus right now, the catch is you are guaranteed delivery on or before December 15th. So you can try the store game going in and seeing if they have it but it's popular. Don't even bother trying to find this great peice of technology in the stores. It's sold out every where.Just order it online. You get automatic rebate, and comes within 2 days with fedex. btw, I LOVE THIS PHONE!!!! SO MUCH BETTER THAN THE IPHONE! !